Canvey Island turned out an assured performance to defeat Romford 2-0 at The Frost Hire Stadium in the Bostik North on Saturday. Manager Mark Bentley made three changes from the side that were knocked out of the Buildbase FA Trophy a week earlier. Jordan Cox and Marlon Agyakwa came in for Martin Tuohy and Josh Hutchinson, while Jose Figura was also introduced which allowed James White to drop back into defence and fill the void left by the injured Elliott Warren. There was also a place on the bench for Frankie Stone, a 17-year-old left back who has joined on work experience from Colchester United. The Romford starting XI included a familiar face in the form of ex-Canvey attacker Taylor Tombides. The first chance of the match came after only four minutes when a ball from deep on the left by Romford’s Kurt Smith went over the head of James White and found Ryan Reed. The forward pulled the trigger from 18 yards, forcing a save from goalkeeper Harry Palmer diving low to his left. 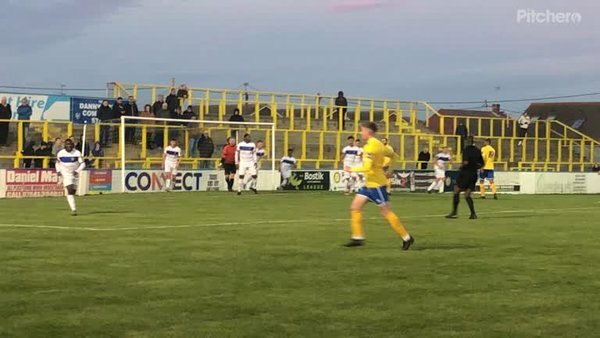 Canvey had their first attempt eight minutes later when Jack Simmons ran the ball infield from the left and played it out to Marlon Agyakwa on the opposite flank. Agyakwa sent over an excellent cross which Jordan Cox headed down into the ground before the ball bounced wide of the top corner. A minute later an under hit back pass from James White put Canvey in trouble, but thankfully Harry Palmer was alert to the danger and raced off his line to clear just ahead of Ryan Reed. As the half wore on Canvey began to dominate possession but were unable to make the break through. Jordan Cox did have chances to open the scoring, but after seeing a shot saved on 27 minutes he then volleyed over from 12 yards after George Allen had cut the ball back to him from the right following a short corner routine. As with the first half, it was the visitors who created the first chance five minutes into the second half. The ball was played from the right into the feet of Kurt Smith, but after he had cut inside George Allen he fired his shot over the bar from the edge of the box. Jack Simmons had a shot from a similar area tipped round the post by Rhys Hughes on 52 minutes, and eight minutes later both Jordan Cox and Frankie Merrifield had goalbound shots blocked inside the six-yard box following a corner. The pressure was building, and a minute after substitute Josh Hutchinson had a flick on header goes inches wide, Jordan Cox nodded Canvey ahead. Frankie Merrifield stood up an excellent ball from the left to the back post where Cox was on hand to leap high and head home from close range. The Gulls nearly doubled their advantage inside sixty seconds of the restart following a determined run by Jack Simmons cutting in from the right, but his shot went the wrong side of the post from 18 yards. The points were sealed on 76 minutes when a short corner was played back to substitute Ryan Melaugh on the left. The winger sent a deep cross over which eluded everyone including the goalkeeper and went straight in at the far post. Canvey didn’t take their foot off the pedal and created further chances, with Josh Hutchinson shooting a yard over from the edge of the box before Jordan Cox lobbed the ball a similar distance over having gotten in behind the Romford defence.